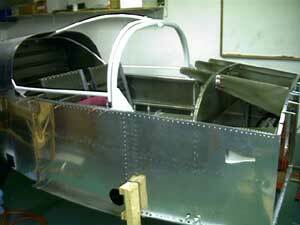 You start by fitting the forward roll bar, and rear canopy support. Everything is referenced from the forward roll bar which must be exactly in the right place, and perpendicular to the longeron. In getting the slider track bolts in, I came up with a little tool after 2 hours of wrestling with washers and nuts. The track channel makes it impossible to get the washers and nut on at the same time. By buddy Paul said he had no trouble. I asked him how he got the washers in there. He said "what washers?" Throw your nut and washers in this little contraption and your bolt , washers and nut will be attached in seconds. The day came for the dreaded cutting of this beautiful piece of plexi. 70 degrees plus is required. Don't take off any more than you want to put back later. 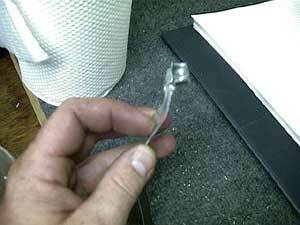 (hint, you cant piece plexi back together so don't even try it) Take a little bit off at a time. Make several passes over the plexi to get through it. It is very thick stuff. It makes a giant mess, and smells like burnt plastic when cutting. The first rough cut gives you this left. Then you set it up on the fuse and begin getting an idea of what needs to come off, and how much. From here on out it is baby steps, baby steps, baby steps. Nipping away till it fits perfectly.